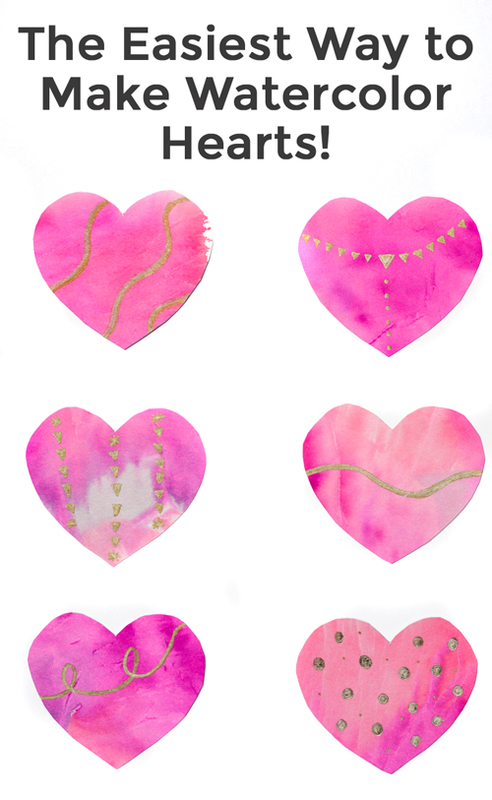 How Adorable Is This Watercolor Heart Kid's Craft!? We love crafting in our house and ever since we discovered watercolor prints with tissue paper we’ve been obsessed! 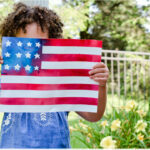 We’ve made a robin’s nest garland, American flag and evergreen tree garland using this technique. 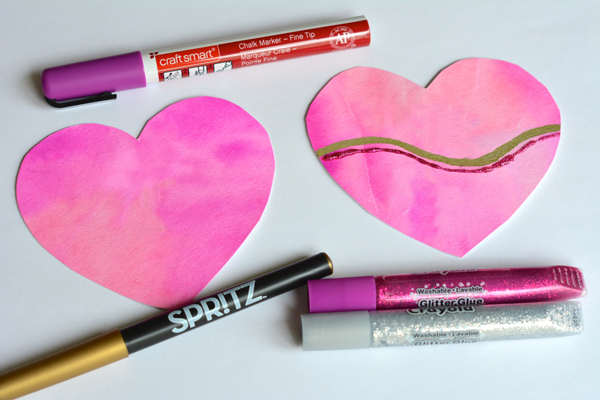 It’s only fitting we made this watercolor heart kid’s craft for Valentine’s Day. 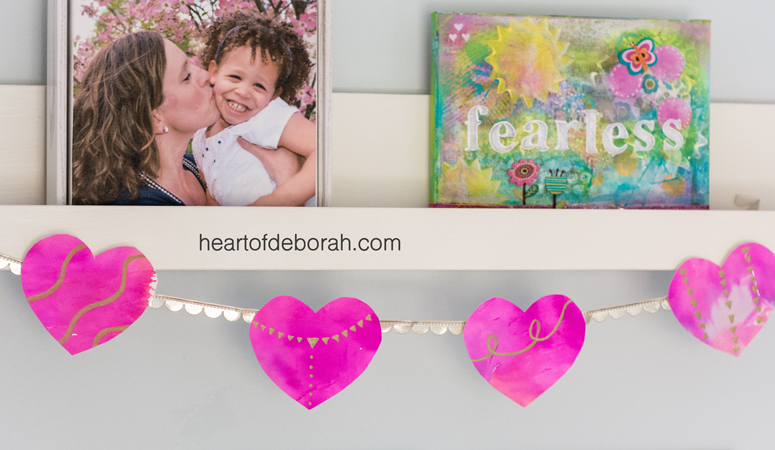 Though I must admit I’m considering keeping these pink and gold hearts up all year long in our daughter’s room. 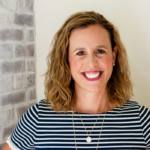 Today I’m sharing with you this simple to craft to make with your children (or even as an adult!). After you gather your supplies spray the watercolor paper. Make sure it is covered completely with a light layer of water. If it isn’t covered completely you may end up with some white spots without ink. I kind of like it as an artistic touch, but if you want it full of color, spray and rub the water completely over the watercolor paper. Then add tissue paper. Medium to dark colors work best. 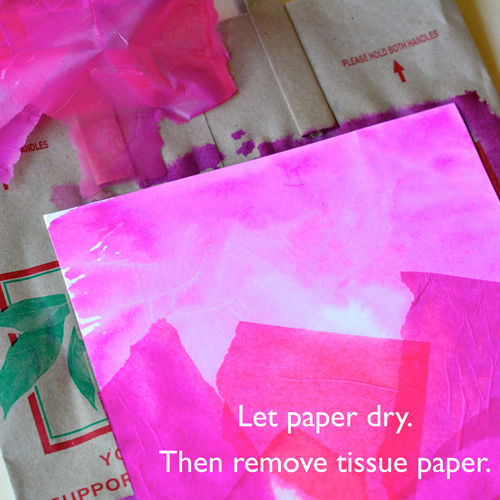 After you cover the watercolor paper with tissue paper, spray the entire paper again. Then let it dry for 2 hours (or longer if it is still damp). After it is completely dried, remove the tissue paper and admire your work of art! 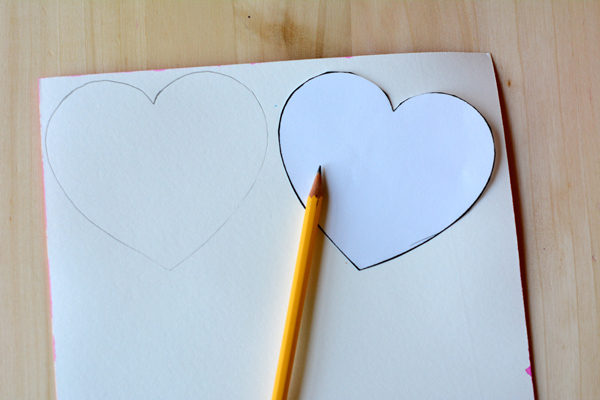 Next, trace heart shapes on the back of your paper. Our hearts were approximately 4 inches wide. After you cut out your hearts you can decide how you want to decorate them. We added doodles and swirls with chalk markers and the Spritz pen from Target. My daughter also wanted to use her glitter glue on a few of the hearts. Decorate as you wish! We decided to add our decorated hearts to garland we found in the Target dollar bins, but you can also use yarn or baker’s twine. I also think they would look adorable as Valentines with handwritten messages on the back or glued on to white stock card. 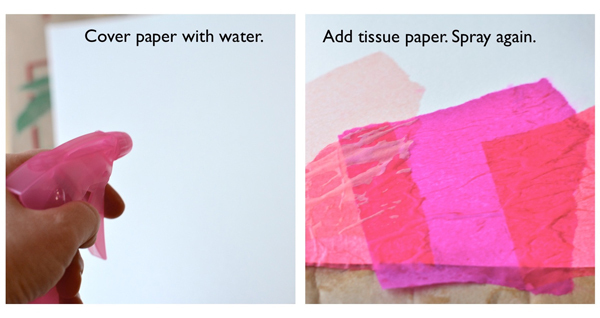 Have you ever made watercolor art with tissue paper before? I hope you enjoy this craft with your children. 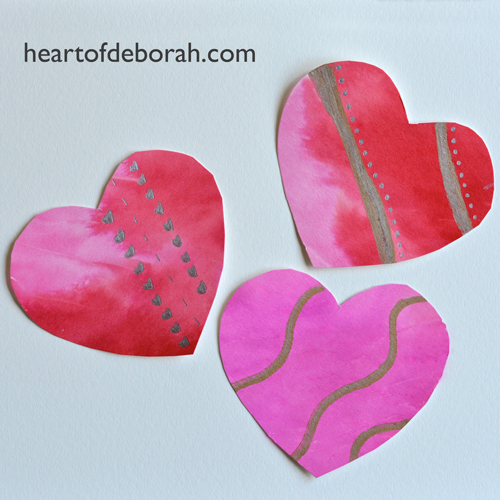 If you decide to make the watercolor hearts tag @heartofdeborah on social media so I can see your designs! Also be sure to follow us on Pinterest for more unique kid’s crafts. ❤ Can you speed up the drying time with a hair dryer? 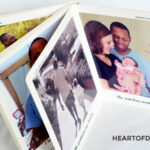 I love crafts post and these are adorable !!! These are too cute! We’ve never made watercolor art with tissue paper before. My girls would love to make these and decorate their rooms with them. This is so cool! Thanks for sharing, I will have to try this out!